Sadly, the warm weather has passed and with the leaves falling brings comes the colder temperatures as well. Of course as winter approaches the roads become slippery and there are automatically more hazards present on the roads. This can be stressful for drivers and fleet managers because unexpected slowdowns can affect day-to-day operations. 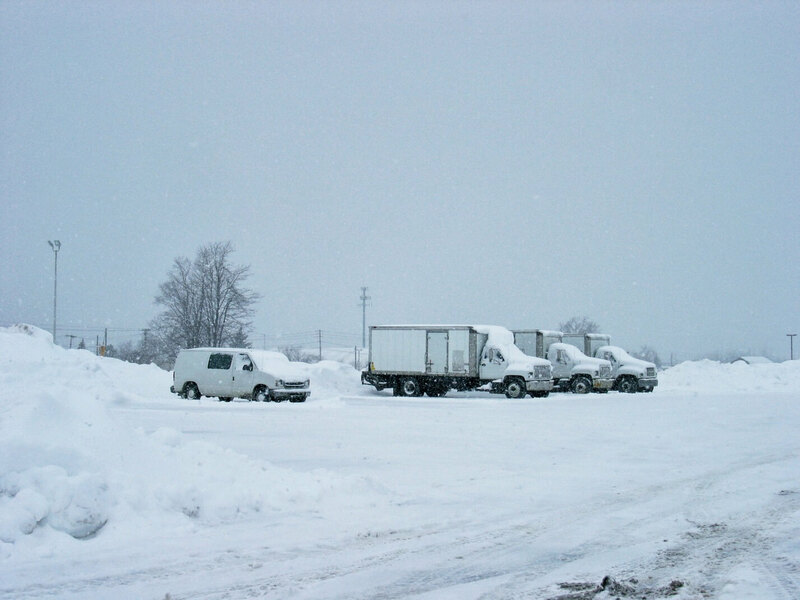 Here’s how you can simplify your work duties and winterize your fleet properly for the winter season ahead. To start, it is best to look into your manufacturer’s maintenance requirements and conditions for winter weather use. At the end of the day it is the manufacturer that needs to follow terms and conditions if a warranty problem comes into play. Carefully inspect the vehicle by doing a walk-around. You’ll want to look at tire wear and the general condition of the tires. Your tires require extra traction in cold climates where snow and ice are present. If the tires could use replacing, don’t put this important job off. With recaps, severe temperatures can cause the cap to separate from the casing. Check the mud flaps as well for adequate wear, length, and installation. Look at all the lights for operation and brakes and hydraulic and/or air systems for potential leaks. Finally you’ll want to look at the windshield to ensure there are no visible chips/cracks. Cold temperatures can cause a small chip to expand into a large crack which could require replacement all together. If caught early enough your repairs may be minimal but otherwise you could be looking at costly replacement fees. Test the batteries for the cold cranking amps remaining. This is a good sign as to whether your battery will be sufficient and reliable enough as the colder temperatures arrive; all very important information to have. Check the radiator coolant for exact gravity. By doing so, the cooling system can work successfully without taking horsepower away from the engine if it starts to overheat. Be sure you have removed any debris from the front of the radiator, such as mud, bugs, and of course snow. You may need to install a radiator cover to block air from circulating directly onto the radiator surface. This should be checked with your manufacturer going into the winter season. Always look at the belts and hoses. Check that there are no cracks, swelling, or leaks. These can be expensive repairs if they aren’t dealt with in a timely manner. After the engine has warmed up, take a look at the use of the climate controls in the cab. It’s important after all, that your drivers are comfortable temperature wise or you could risk a loss in productivity. At the same time be sure you check that your carbon monoxide detector is working properly. A battery operated carbon monoxide detector will notify you if your trucks leak too much of the colorless, odorless gas into the cab, especially while idling. This can be deadly of course so it is crucial to have tested. Consider an engine heating system. Diesels profit from warm motors, as they make starting easy and reduce the chance that damage will occur during startup. The majority of manufacturers use oil warmers, which keeps the engine oil thickness to a fluid point which in turn helps with the startup process because it’s a much gentler approach on the motor. The second most popular are coolant warmers, which keep the engine block, and all components associated with the cooling system warm. Either way, the end game is to make starting easier and less likely to cause damage on start up. For reliable fleet fueling this winter, turn to Roma Fuels; your total fuel fueling management service. Roma Fuels is a local family business serving our valued clients since 1968. Roma Fuels continues to service Fleet Managers and their crews in ways larger corporations can’t. Wheel to wheel fuel delivery is one of the safest and most reliable ways to get fuel delivered. Our professional drivers go through vigorous certification training to provide quality service to your crew and equipment while keeping your environment safe. Contact us today to schedule quality service for the winter season ahead!